Wassenaar is a small town, in the western area of the Netherlands, close to The Hague. Not many people know the role of this city in the history of spaceflight: it was the place from where the first V-2 rocket was launched during World War II. The V-2 rocket was a revolutionary weapon, the first long range ballistic missile ever. 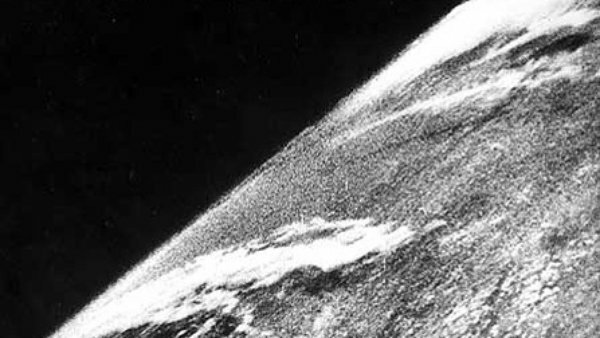 It set the basis for Intercontinental Ballistic Missiles (ICBM) and space exploration. The 2500 casualties that the V-2 rockets caused during the final phase of World War II is not something to be proud of, but the fact remains that the V-2 made the story of space exploration possible as a direct precursor of the rockets that took humans to the moon. Location of Wassenaar in the Netherlands from which the V-2 rocket was launched (Credits: Google Maps). Fueled by alcohol and liquid oxygen, the V-2 was developed by the Germans under the leadership of Wernher von Braun, the “Father of Rocket Science” who later led the development of American missile and rocket technology. The Germans started to work on the development of the V-2 in the mid-1930s, at the Peenemünde Army Research Facility, in a village with a seaport north east of Germany. On October 3, 1942 the Germans had their first successful V-2 test firing from Peenemünde. After this first successful test, they carefully selected a strategic location in The Netherlands for their first operational launch. This is where the town of Wassenaar enters the V-2 story. The Germans were looking for a place that could facilitate the supply and preparation of the V-2 rockets with good road and rail infrastructure and potential areas of camouflage for protection. 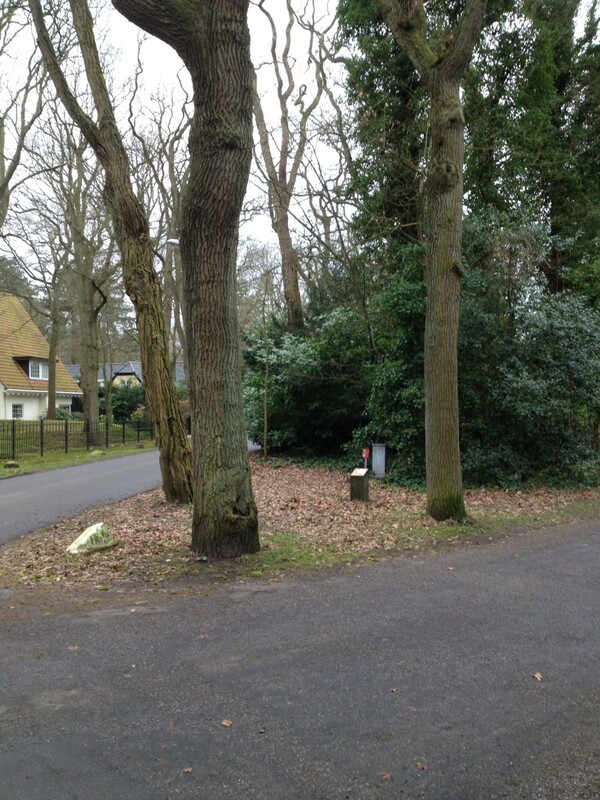 Wassenaar was the perfect place for the purpose thanks to the vicinity of the North Sea and the trees that covered the area. Besides visual cover, the trees protected the rockets from the wind during lift off, improving their stability. 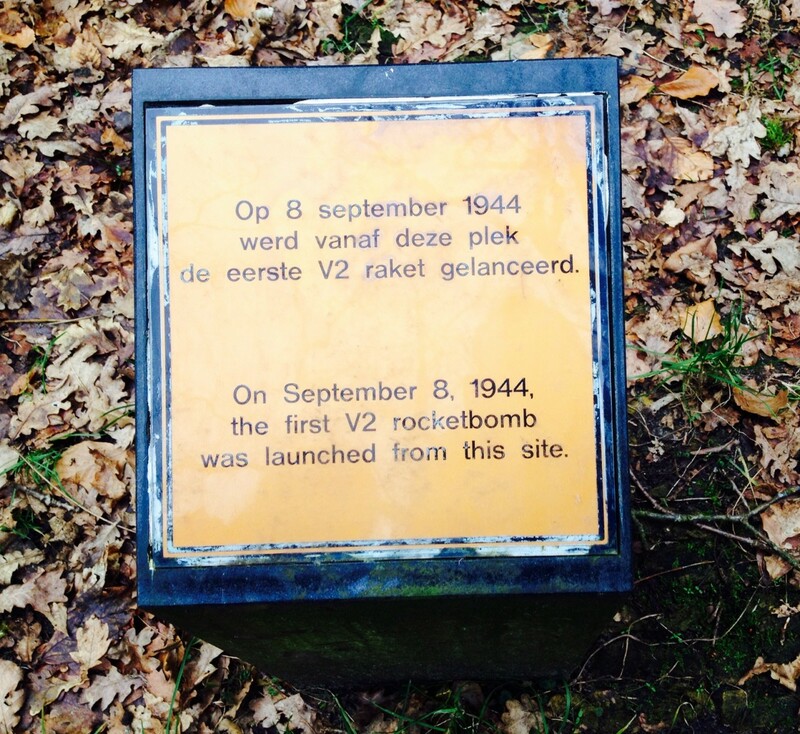 Memorial plaque for the first V-2 rocket launched from Wassenaar (Credits: Carmen Felix). The first V-2 was launched on September 8th 1944, from Wassenaar and it was directed to London. There were two simultaneous rocket launches from Wassenaar, one on the crossroads of the streets Lijsterlaan, Konijnenlaan, and Koekoekslaan , and the other one from the crossroads of the streets Lijsterlaan and Schouwweg. One of the rockets hit Chiswick in west London, killing three people and injuring 17 more; the second one hit Epping, 27 km north of London, without casualties. People from Wassenaar still remember the thunder of the rocket engines and some of them claim that the launches made cracks on the walls of their houses. At the launch sites there were burn marks and melted sections of the roads, but in the center of each burned site there was an unburned box-shaped area, suggesting that there was a supporting tool used there. The trees nearby were severely damaged up to one meter high, and the grass around that area was gone. The neighbors saw large trucks with about 16 wheels transporting material, and a crew of German soldiers completely covered with asbestos helmets and overalls. The tubes used for transferring the liquid for the rocket were covered in frost, suggesting that they were using liquid oxygen. The area of Wassenaar was not safe anymore, and on Sunday September 10, the Dutch government ordered the evacuation of the surroundings. When launched, the V-2 had a 65 second burst from its engine that put the rocket in a parabolic arc reaching up to 95 kilometers of altitude before it entered into a ballistic descent, traveling faster than the speed of sound. It produced a crater 20 meters wide and 8 meters deep on impact, ejecting more than 3,000 tons of material into the air. This rocket was lethal because it could not be stopped or intercepted once in flight. Traveling at Mach four, faster than its own sound, it fell on its victims without any warning. The memorial plaque is found at the intersection of the Lijsterlaan, Konijnenlaan and Koekoekslaan roads in Wassenaar (Credits: Carmen Felix). Moving from place to place, the Germans used the advantage of the V-2 to be able to be launch from mobile equipment, and they only needed two hours in one site to launch a missile before moving to the next place, avoiding enemies. In total, an estimate more than 3,000 V-2 were launched by the Germans during World War II. 80% of the V-2s launched at London were fired from the area of The Hague, with the others launched near Hook of Holland. After World War II, the Soviet Union and Americans started a race in pursuit of acquiring as many German rocket scientists as possible, and the remaining samples of V-2 with the end goal of developing their own rocket technologies. Von Braun surrendered to the Americans, and was allowed to immigrate to the States cleared of his Nazi past The rest, as they say, is history. On September 8, 2004, sixty years after the fateful first launch of the V-2, Mayor Van den Muijsenberg of Wassenaar unveiled a small monument in memory of this event. The ceremony took place at 18:35 hours, the exact time of the launch. The plaque reads in Dutch and English: “On September 8, 1944, the first V-2 rocket bomb was launched from this site.” This significant location is an everyday crossroad intersection and if you don’t pay too much attention you can even missed the small plaque that was raised in honor of this event. A similar memorial plaque was placed in the small town of Chiswick in London, in memory of those who died following the V-2 explosion. Feature image caption: The V-2 rocket is carried on the Meillerwagen to the firing position (Credits: Imperial War Museum). This is a nice article. May I mak a few minor comments? First of all, Peenemünde is at the North-East Baltic coast of Germany; not North-West. Because alcohol in the Peenemünde area was relatively easily available, there were a larger number of drunks there than in other parts of wartime Germany. This made the British secret service suspicious, leading to aerial survey followed by bombing. It was not the Dutch government that evacuated Wassenaar, but the German occupation. Not in view of the safety of people, but because of secrecy and preventing the resistance to take subversive actions. During the war, two Dutch scientists (J. M. J. Kooy and J. W. H. Uytenbogaart) spied on the V2 launches, photographed damage, collected parts and debris and after the war published the first book on Rocket Propulsion, Trajectory Analysis and the construction of the V1 and V2, with many local photographs and detailed drawings: Ballistics of the Future. The book was published in the Netherlands in 1946 followed by a publication in the USA (Van Nostrand) in 1948. The book is a classic and now a collectors item. Thanks for sharing your insights into this historical moment! And you are absolutely right, Peenemünde is east of Germany – we’ve made that correction.